7 Up is a brand of lemon-lime flavored, non-caffeinated soft drink. The rights to the brand are held by Dr Pepper Snapple Group in the United States, and PepsiCo (or its licensees) in the rest of the world. The U.S. version of the 7 Up logo includes a red spot between the ‘7’ and ‘Up’; this red spot has been animated and used as a mascot for the brand as Cool Spot. 7 Up was created by Charles Leiper Grigg, who launched his St. Louis–based company The Howdy Corporation in 1920. Grigg came up with the formula for a lemon-lime soft drink in 1929. The product, originally named « Bib-Label Lithiated Lemon-Lime Soda », was launched two weeks before the Wall Street Crash of 1929. It contained lithium citrate, a mood-stabilizing drug, until 1950. It was one of a number of patent medicine products popular in the late-19th and early-20th centuries. 7 Up has been reformulated several times since its launch in 1929. In 2006, the version of the product sold in the U.S. was re-formulated so that it could be marketed as being « 100% natural« . This was achieved by eliminating the chelating-agent calcium disodium EDTA, and replacing sodium citrate with potassium citrate in order to reduce the beverage’s sodium content. This re-formulation contains no fruit juice and [in the U.S.] is sweetened with high-fructose corn syrup (HFCS). The manufacturing process used in the production of HFCS has led some public health and advocacy groups to challenge the ad campaign‘s « natural » claims. In 2007, after the Center for Science in the Public Interest threatened to sue 7 Up, it was announced that 7 Up would stop being marketed as « 100% natural ». Instead, It is now promoted as having « 100% Natural Flavors ». The controversy does not extend to other countries, such as the United Kingdom, where HFCS is not generally used in foods, including 7 Up. 7 Up is a common folk remedy, for example relieving stomach aches. In 2011, 7 Up began test-marketing a formula, called 7 Up Retro, using sugar rather than HFCS. Container labels sport the caption, « Made With Real Sugar ». There exists a myth that the 7 Up name comes from the drink having a pH over 7. That would make it neutral or alkaline on the scale; however, this is not the case, as the 7 Up pH is close to 3.79, similar to other drinks of the type. The real origin of the name is unclear, though Britvic claims that the name comes from the seven main ingredients in the drink. This 2011 formulation uses sugar rather than high-fructose corn syrup as its sweetener. Introduced on the 2011 season finale of The Apprentice, packaging in 12 oz. cans features either the 1970s disco mirrorball themed logo or the 1980s logo. It is also available in 12 oz. glass bottles with a label inspired by 7 Up’s original logo. which was featured on the TV series Survivor. Product currently being test marketed. This diet soda was originally introduced in 1963 as Like (not to be confused with 7 Up’s Like Cola from the 1980s), it was discontinued in 1969 due to the U.S. government ban of cyclamate sweetener. After reformulation, it was reintroduced as Diet 7 Up in 1970. It was renamed Sugar Free 7 Up in 1973 then back to Diet 7 Up in 1979. Diet 7 Up was reformulated and advertised as being sweetened with Splenda (sucralose); the formula has been re-tooled and listed the following ingredients: filtered carbonated water, natural flavors, citric acid, potassium citrate, potassium benzoate, aspartame, acesulfame potassium, calcium disodium EDTA. The ingredients for Diet 7 Up with Splenda are: filtered carbonated water, natural flavors, citric acid, potassium citrate, potassium benzoate, calcium disodium EDTA, acesulfame potassium, sucralose. The 7 Up Company claims they switched back to aspartame because they conducted a nationwide study showing that people preferred the taste with aspartame instead of with Splenda. Cherry 7 Up flavor, with these ingredients listed: Carbonated water, high fructose corn syrup, citric acid, natural and artificial flavors, potassium benzoate, red 40. One known ingredient among the « natural and artificial flavors » is apple juice. It was renamed and reformulated as Cherry 7 Up Antioxidant in January 2009. Contains 10% of U.S. daily recommended Vitamin E dosage per 8 fl oz serving (4.2% per 100 ml). On November 8, 2012, Dr Pepper Snapple Group said they will pull 7Up with antioxidants off the shelves to reformulate them by 2013. They also said that its decision was not related to the lawsuit, but because of consistency across the board. Diet Cherry 7 Up has recently been re-introduced due to popular demand after having been missing due to the existence of 7 Up Plus Cherry flavor. Ingredients are: filtered carbonated water and contains 2% or less of each of the following: citric acid, natural and artificial flavors, potassium benzoate (protects flavor), aspartame, potassium citrate, acesulfame potassium, red 40. Phenylketonurics: Contains phenylalanine. This flavor was available for a short time in Norway during the mid-1990s. It was released at the same time as Raspberry 7 Up. It was a clear colored lemon, lime and orange flavored soft drink. It was pulled off the market after 2–3 years. Today 7 Up Orange can still be bought in Austria. This flavor was available for a short time in Norway, Denmark (and possibly other European countries) during the late 80s. It was released at the same time as Orange 7 Up. It was a clear colored lemon, lime and raspberry flavoured soft-drink. It was pulled off the European market after 2–3 years, but can still be found in several Southeast Asian countries such as Singapore. 7 Up Free is sold in the UK, Ireland, Norway, Argentina, Iceland, Finland, UAE, Uruguay and Pakistan. It contains no caffeine, sugar, colorings or preservatives and is marketed as « Natural Lemon and Lime flavour » similar to the « 100% natural » American version. It contains a combination of artificial sugars, and for eight years was the only variety on the Norwegian market. The lack of the usual light or zero-label is confusing to Norwegian consumers, who often buy it not knowing they are buying a product with artificial sugars.. In the UK, 7 Up Free has been sold in a 600ml, rather than 500ml bottle since early 2010. This is part of 7-Up’s UK manufacturer Britvic‘s heathly living push whereby sugar free product versions are sold in a larger bottle. 7 Up Lime is sold in the U.S. and in Argentina. In the U.S. it is not as strong and is less carbonated. In Argentina it is much more carbonated and is 5% lime juice. 7 Up Cherry is a variant currently available in the UK. It is a different drink from Cherry 7 Up and uses a different recipe. 7 Up Gold was marketed for a short time in 1988 as a spice-flavored beverage, similar to Vernor’s Ginger Ale. Even though 7 Up’s marketing slogan at that time was Never Had It, Never Will (referring to caffeine), 7 Up Gold did list caffeine as one of its ingredients. It was introduced by 7 Up in the hopes of capturing 1% of the cola market. However, it only captured one-tenth of one percent of the cola market apparently because people were confused by 7 Up marketing a soft drink with caffeine, and therefore it was discontinued. The 7 Up Gold recipe was actually an unused Dr Pepper invention. dnL was the name of a soft drink produced by Cadbury Schweppes Americas Beverages in the United States. It was part of the 7 Up family of soft drinks, and was introduced in September 2002. It was launched in the same year as other attempts to extend soft drink brand names with new variations, including Pepsi Blue, Dr Pepper Red Fusion and Vanilla Coke. 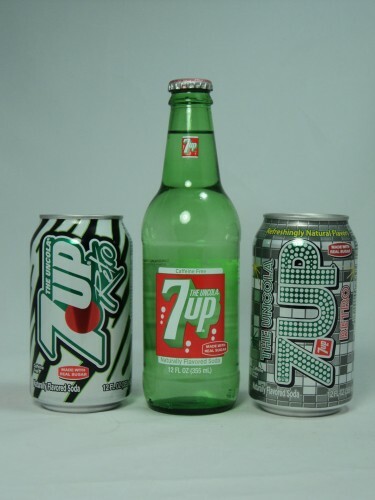 It had arguably been poorly marketed, and, while it remained listed as an official product of the company in late 2005, it was scheduled to be discontinued for 2006 in favor of the « 7 Up Plus » brand. The product’s name came from the fact that the « dnL » logo is the « 7 Up » logo turned upside-down. The product itself was also, in many ways, the opposite of 7 Up: while 7 Up is caffeine-free, colorless, and comes in a green bottle, dnL contained caffeine and was an unusual shade of green (vaguely similar to the green of 7 Up’s bottle) in a clear bottle. And while 7 Up has a fairly standard lemon-lime flavor, the « citrus » flavor of dnL is that of lime-lemon, (primarily lime flavored with a hint of lemon). Available in Canada in the early 2000s. 7 Up Plus was a family of fruit-flavored soft drinks, produced by Cadbury-Schweppes. Touted as a healthy alternative, it contained no caffeine and has 2 grams of carbohydrates per serving, as well as 5% apple juice, which is uncommon among American market carbonated beverages. It is sweetened with Splenda, and the original flavor, Mixed Berry, was released in summer 2004. Two additional flavors have been added to the line: Cherry and Island Fruit. In Ireland in 2007, 7 Up launched a range of flavored water. 7 Up sponsored the Jordan Formula One team in their first year, the 1991 season. Crisp and Clean, and No Caffeine. In conjunction with the 1999 marketing slogan « Make 7 Up Yours », 7 Up distributed shirts that said « Make 7 » on the front and « Up Yours » on the back. Television and radio advertisements featured Orlando Jones walking down a street talking about 7 Up with people seemingly angry or shocked by the risqué phrase « up yours« . The ads and slogan quickly became popular, and the campaign lasted until 2005. Fresh-Up Freddie was the rooster mascot for 7 Up in 1950s. He gave viewers lessons about how to plan successful parties and picnics by having a plenty of 7 Up on hand. The commercials were produced by Disney, giving the character the specific Disney look of the time. Freddie was a crossover between Panchito rooster from The Three Caballeros and zany Aracuan Bird from the same film. Fresh-Up Freddie often was dressed in human clothes. Freddie also appeared in Zorro 1957 series commercial intermissions. Here, he was put against Pete the Cat. Fresh-Up Freddie also had a minor merchandise of his own. He was voiced by Paul Frees. ^ « 7 UP: The Making of a Legend« . Cadbury Schweppes: America’s Beverages. ^ Gielen, Marcel; Edward R. T. Tiekink (2005). Metallotherapeutic drugs and metal-based diagnostic agents: The use of metals in medicine. John Wiley and Sons. p. 3. ISBN 0-470-86403-6. ^ « Frequently Asked Questions. » 7up.com. ^ Center for Science in the Public Interest (May 11, 2006). CSPI to sue Cadbury Schweppes over « All Natural » 7 Up. Press release. ^ El ph de la Seven UP NO ES DE 7!!! ^ « Photo of 7 Up Bottles ». Retrieved 2012-11-11. ^ a b « 7Up Timeline and History ». Twoop.com. 2005-08-29. Retrieved 2010-07-28. ^ « Internet Archive Wayback Machine ». Web.archive.org. Retrieved 2010-07-28. ^ « Diet 7 Up Nutritional Facts« . 7up.com. ^ « Diet 7 Up with Splenda Nutritional Facts« . 7up.com. ^ « 7Up with antioxidants to be taken off the market ». Tulsa World. November 9, 2012. Retrieved November 10, 2012. ^ « 7Up with antioxidants to be discontinued amid health claims lawsuit ». CBS News. November 9, 2012. Retrieved November 10, 2012. ^ « The Slug.com. » The Slug: Rejoice! Diet Cherry 7 Up to Return to Us!. ^ « Diet Cherry 7 Up Nutritional Facts« . 7up.com. ^ McGill, Douglas C. (1989-02-11). « 7-UP Gold: The failure of a can’t-lose plan ». New York Times. ^ « DNP for 7 Up’s dnL ». bevnet.com. 2005-07-27. Retrieved 2010-07-28. ^ « 7 Up With Estrogen Announced ». Fizzledout.com. Retrieved 2010-07-28. ^ « Review: 7Up Plus: Island Fruit ». Bevreview.com. Retrieved 2010-07-28. ^ « Fresh-Up Freddie character profile on Don Markstein’s Toonopedia ». Toonopedia.com. Retrieved 2010-07-28. Wikimedia Commons has media related to 7 Up. Ce contenu a été publié dans marques par fuefbre55gr. Mettez-le en favori avec son permalien.